The February 18 online edition of The Chronicle of Higher Education includes the lists of "Top Producing" schools – those institutions in each Carnegie Classification that had the highest number of students and scholars who received Fulbright grants this year. Congratulations to all those institutions whose scholars and students received Fulbright grants this year and especially to those listed in this year's top producing lists. We would like to thank Fulbright Scholar Liaisons for their efforts to promote the program on their campuses. To view the full list of grantees for 2017-2018, visit our Scholar Directory. To find out details on your campus's involvement with the Fulbright Scholar Program, please contact Peter Vanderwater; for details regarding the Fulbright Student Program, please contact Heather Theisen-Gandara. The Fulbright U.S. Scholar Program is a program of the U.S. Department of State, funded by an annual appropriation from the U.S. Congress to the Bureau of Educational and Cultural Affairs, and supported in its implementation by the Institute of International Education’s Council for International Exchange of Scholars. Since its inception in 1946, the Fulbright Program has provided more than 380,000 participants with the opportunity to study, teach and conduct research, exchange ideas and contribute to finding solutions to shared international concerns. 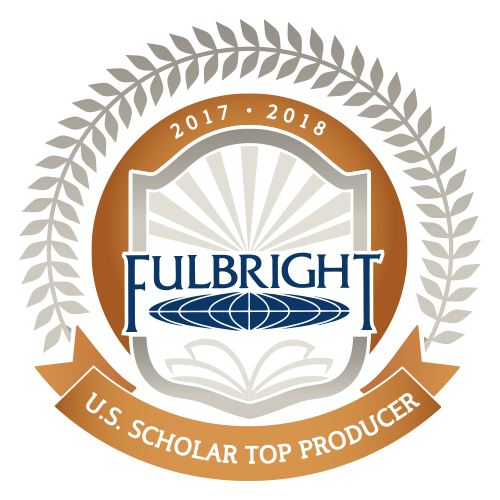 Visit topproducing.fulbrightonline.org to view the complete list of 2017-2018 Top Producing Institutions of Fulbright U.S. Scholars and Students. You can find out more about the Fulbright Scholar Program at cies.org, or on the State Department's Fulbright website.